MILWAUKEE (AP) — Milwaukee Bucks coach Mike Budenholzer was seething over what he perceived as a lackadaisical effort in the first half Friday night and unloaded on his team at halftime. It was the Bucks’ largest comeback win of the season and they tied the second-largest halftime deficit overcome in franchise history. Holiday was perfect from beyond the arc for Chicago in the first half. He sank all six attempts, three in each quarter. The last one just before the end of the second pushed the Bulls’ lead to 63-41. Parker keyed the Bulls’ first quarter with 15 points, five off his season-high. He hit three 3-pointers and a pullup jumper that capped an 11-2 surge for a 16-point lead at 35-19. 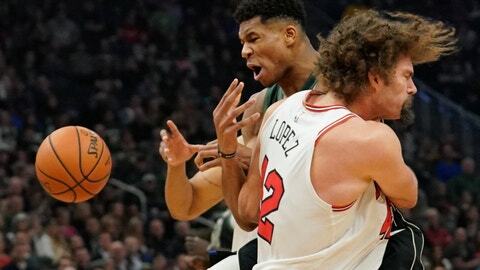 The Bulls’ scrappy defense forced seven turnovers good for 15 points. Chicago converted 17 Bucks’ turnovers into 30 points. Milwaukee forced 12 miscues for 13 points. The Bucks scored 52 points in the paint to the Bulls’ 38.